MWM NEWS BLOG: Featured. Faesthetic #10. Faesthetic Magazine #10 drops today and features artwork from 35 international artists. This issue's theme is "Scams & Deceit". I can't wait to see everyone's interpretation and visual narrative for this one. 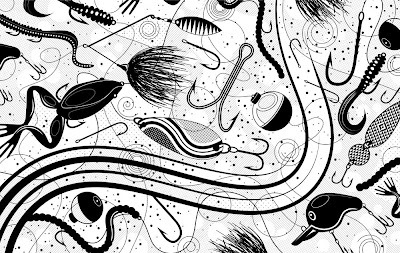 My contribution is this Fishing Lures Vector Illustration (Click-Zoom). The issue is only ten bucks, and as always, 100% advertisement-free. Order a copy of Faesthetic #10.